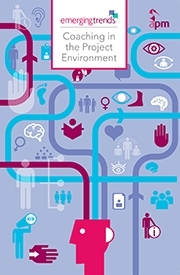 The Association for Project Management (APM) has just published an e-book on Coaching in the Project Environment. We are delighted that the 20 Degrees team contributed significantly to this publication. Alun, started the initial blog discussions around the topic and identified the team of contributors for the e-book. Miles wrote the opening chapter. The e-book is a free resource, openly available via the APM website. We strongly recommend you take this opportunity to explore coaching and decide whether it can help you. Coaching has been recognised for many years as a key mechanism for embedding skills learned through a training programme. Less attention has been given to coaching in the project environment. Alun and Miles contributed to the debate by organising a coaching taster event for the Association of Project Management (APM) An extract from the APM's Network July 2014 newsletter highlights the benefits of even a single 45 minute session for participants. Even if meeting a coach is time or cost prohibitive, one option is to engage in coaching via a web conferencing mechanism such as Skype. As the participants in this taster session found, it can be worth a relatively small investment. We are delighted to be able to offer PRINCE2 foundation and practitioner courses. This extends our project management offer, building on the training activity we have been undertaking with organisations such as North Somerset Council and DAS. As Alun, one of our directors put it, 'All of our work is undertaken in a project context. The ability to offer PRINCE2 courses was a logical step in our development. Given our other director, Miles, has been a PRINCE2 trainer since 2003, it was an obvious addition to our portfolio'. PRINCE2 is a registered trademark of AXELOS Ltd. APMG-International is an Examination Institute for PRINCE2. USW Commercial Services Ltd is an Accredited Training Organisation of APMG-International. 20 Degrees Consulting Ltd is an Affiliate of USW Commercial Services Ltd.
We are delighted to launch our programme of training courses for 2014. We aim to provide a series of practical and highly participatory courses that impact positively on organisations...yet provide excellent value for money. Broomfield & Alexander, the largest independent firm of accountants in Wales, is sponsoring our first event. The 'Effective Change Management' course will be held at their Cardiff site at Cardiff Gate Business Park on 20th March. The event will help leaders navigate a rapidly changing environment by introducing key tools, techniques and best practice change management approaches. The course will be led by Miles Huckle, a change management specialist and multi-accredited trainer. Details of the course can be found here and a course booking form can be found here.